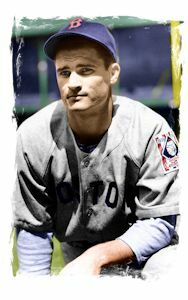 Bobby Doerr was called the "Silent Captain" of the Red Sox by none other than Ted Williams. The two had known each other since 1936, when both were with the San Diego Padres (a Minor League team at the time). Born in the city of Los Angeles on April 7, 1918, Robert Pershing Doerr was one of the four Sox from the West Coast who starred in the 1940s - Williams from San Diego, Doerr from Los Angeles, Dom DiMaggio from San Francisco, and Johnny Pesky from Portland, Oregon. Bobby played high school ball for two years at Fremont High, in 1933 and the first part of 1934, but he'd been working out some with the Hollywood Sheiks. Doerr played 67 games for Hollywood in 1934, batting .259, all but six of the 16-year-old’s 52 hits being singles. In 1935, the Red Sox purchased an option on the contracts of both Doerr and teammate George Myatt, paying a reported $75,000. In July, Eddie Collins came to look over the pair and took Doerr's contract but declined Myatt. Collins also noticed a young player named Ted Williams and shook hands on the right to purchase Williams at a later time. Doerr was 18 years old when he headed east for his first spring training with the Red Sox, traveling across the country to Sarasota, Florida, with Mel Almada. Doerr made the team in 1937, batting leadoff on Opening Day and going 3-for-5. Doerr played his entire 14-year career with the Red Sox and was Boston's regular second baseman from 1938 to 1951. Doerr was named to the first of nine American League All-Star teams in 1941; he played in eight games, starting five of them, and his three-run home run in the bottom of the second inning of the 1943 game, off Mort Cooper, made all the difference in the 5-3 AL win. Doerr anchored the second base slot for Boston through the 1951 season, missing just one year (and one crucial month) during World War II. The month was September 1944. When the war broke out, Bobby was exempt because he and his wife Monica had a young son, Don. He'd also been rejected for a perforated eardrum. As the war rolled on, the military needed more and more men and the pressures on seemingly-healthy athletes intensified. After the 1943 season, Doerr took a wintertime defense job in Los Angeles, working at a sheet metal machine shop run by the man who had managed his old American Legion team. When he left the defense job to play the 1944 season, he received his draft orders and was told to report at the beginning of September. By the time September came around, the Red Sox were in the thick of the pennant race, just four games out of first place - and both Doerr (.325 at the time, his .528 slugging average led the league) and Hughson (18-5, 2.26 ERA) had to leave. The team couldn't sustain those two losses and their hopes sputtered out. Because of the war, Doerr missed the entire 1945 season. He had made his home in Oregon and so reported for induction in the United States Army in Portland. He was first assigned to Fort Lewis and a week later reported for infantry duty at Camp Roberts. After completing the months of training, word began to circulate within his outfit that they were being prepared to ship out to Ford Ord, and then overseas for the invasion of Japan. President Truman brought the whole thing to a halt by dropping two atomic bombs on Japan. After the war, Staff Sergeant Doerr changed back into his Red Sox uniform and returned to the 1946 edition of the Red Sox. He drove in 116 runs, his highest total yet – thanks to the potent Boston batting order. Doerr hit for the cycle twice (May 17, 1944 and May 13, 1947); he is the only Red Sox player to do it more than once. In a June 8, 1950 game, he hit three homers and drove in eight runs. Despite the power demonstrated by his 223 career home runs, his fielding was at least as important. He was always exceptional on defense, more than once running off strings of over 300 chances without an error. He led the league 16 times in one defensive category or another and wound up his career with a lifetime .980 mark – at the time of his retirement, he was the all-time major league leader. In early August 1951, in the midst of another excellent year, Bobby suffered a serious back problem. He'd hurt it a bit bending over for a slow-hit ground ball; he felt something give, but continued the game. Quite a while afterwards, he woke up one morning and found he could hardly get out of bed or put on his shoes. He got some treatment but missed nearly three weeks before returning to play. He got in only a few more games. The problem persisted, and he had to bow out after just one at-bat in the first game of the September 7 doubleheader. Fears that it was a ruptured disc proved not the case and surgery was ruled out, but Doerr was told to rest the remainder of the season. He'd played 14 seasons in the majors and had a good career. Though only 33, he didn't want to risk more serious injury and decided to retire to his farm in Oregon. In his one Postseason opportunity, the 1946 World Series, Doerr batted .409. He served as Red Sox first-base coach in 1967, and Carl Yastrzemski credited Doerr's counsel for helping him win the Triple Crown that year. In 1986, Bobby Doerr and Ernie Lombardi were named to the Hall of Fame by the special veterans committee, and were inducted with Willie McCovey in August that year. On May 21, 1988, the Red Sox retired Bobby's uniform number, #1.